Increased bike ridership to core city events, like the Art Fair, eases traffic and parking congestion while increasing the overall health and sustainability of the community. The number of people bicycling in Holland has increased an incredible 281 percent since the year 2000, far outpacing the national increase of 51 percent, according to U.S. Census Bureau’s American Community Survey. This is great news because of the positive effects bikes have in cities like ours, even for people who don’t ride: Better air quality means fewer asthma attacks and less cardiovascular disease, our streets last longer and cost less to maintain, our neighborhoods are quieter, and we see fewer crashes of all kinds. 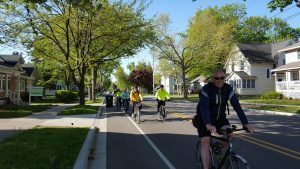 Efforts like the City of Holland Bike Plan encourage and support bike riding, which improves the health and sustainability of the community. Our best guesses for reasons why bicycling is increasing so quickly here also point us toward future improvements that can continue to boost ridership and community sustainability. Those reasons include nearly 200 miles of shared use pathways and 70 miles of on-street routes, in addition to our well-established Green Commute Week program. A recent study by the National Association of City Transportation Officials showed that places with new, high-comfort bike facilities – generally meaning places for bikes that are separated or protected in some way from motor traffic – see an increase between 21 percent and 171 percent in the number of people riding. The number of people biking in Holland has increased 281 percent since 2000, well above the national average, helping boost the health and sustainability of the community. This hints at one way to address two important local challenges – increasing our housing supply and accommodating development in our thriving downtown. Because bicycles take up much less space than cars, shifting some car trips to bicycles will allow us to preserve the character of our downtown and center city neighborhoods while still allowing other traffic to flow smoothly. Even though we see most great bike infrastructure in big cities, small cities like Holland have several advantages over large metropolitan areas in creating a bicycling culture. One of the most powerful is Holland’s relatively small footprint. 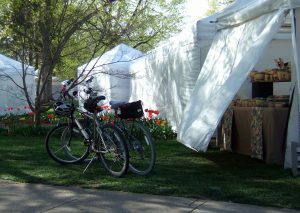 Nationally, 40 percent of all trips are two miles or less, a very reasonable ride for even the most casual bicyclist. Since our metropolitan region is only 10 to 12 miles across in any direction, many of our destinations are already in easy biking distance. Because bike facilities are relatively inexpensive compared to automobile infrastructure, Holland could become a national leader for less than the cost of a single public parking garage. 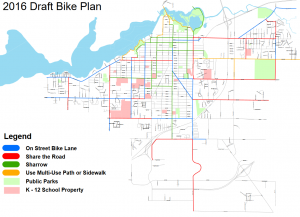 The greater Holland area is off to a great start in becoming a bike-friendly community. If you are inspired to get started riding, keep it simple: Get some lights on your bike, grab a helmet, and move predictably while riding – travel in a straight line in the same direction as car traffic and pay attention to street lights and stop signs. Other bicyclists are a great resource for new riders, too. Join us for a casual Bike Holland ride on Aug. 13 or Sept. 10 at 6 p.m., starting at Velo City Cycles, 326. S. River Ave. in Holland.  Meika Weiss is the founding board chairperson of Pedal Holland, a start-up non-profit advocacy group committed to making bicycling an easy choice for transportation and recreation. Transportation: The movement of people, goods, and services within the area is an evolving system that links us to our regional, national and global networks.